David Cameron has made clear he wants TV debates to take place before the election campaign starts in earnest. The prime minister told the BBC that the three 2010 debates, which took place in the month before polling day, were excellent but had "taken the life" out of the remainder of the campaign. This time around, he said he wanted to get "them over with" before April. Earlier, he said a "deal could be done" if the Northern Ireland parties were included in the broadcasters' line-ups. 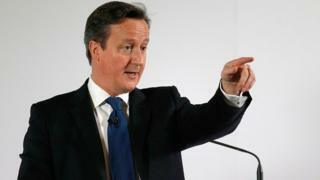 Labour leader Ed Miliband has said he would take part with or without Mr Cameron. The BBC, ITV, Channel 4 and Sky have proposed three debates on 2 April, 16 April and 30 April in the run-up to the 7 May election. The general election campaign is likely to start on 30 March, the day when Parliament is expected to be dissolved. Mr Cameron told the Jeremy Vine show on Radio 2 that he would be "delighted" to take part but suggested the timing had to be right. "I think the debates would be better outside the actual campaign period," he said. "Last time they were a very good initiative but I thought they took the life out of the rest of the campaign and stopped party leaders properly travelling around every part of the country. "So let's get them on and get them over and done with before the campaign and then we can get on with the election campaign." Earlier speaking on BBC Breakfast, the prime minister said: "I do want to say yes, and the point I made was that you couldn't have one minor party, UKIP without having another minor party, the Greens." He added: "It was the broadcasters that decided not only to include the Greens but they also then decided to include Plaid Cymru from Wales and the Scottish National Party from Scotland. "I think the Labour Party and myself both made the point you can't have one part of the United Kingdom - Scotland or Wales - without having another part - Northern Ireland." Labour leader Ed Miliband commented: "I want the debates to happen. David Cameron is wriggling and wriggling on this." He pledged: "I am going to be at those debates, whether it's an empty chair or David Cameron." Nigel Dodds, the deputy leader of the Democratic Unionist Party, said Mr Cameron's comments vindicated his party's position. "The prime minister still recognises the flaws in the proposed format and it is now time for the broadcasters to rethink their structure," he said. A spokesperson for Sinn Féin said the party was "taking advice from our legal team over our lack of inclusion in the TV debates". The prime minister was previously criticised for saying he would not participate if the Green Party's leader, Natalie Bennett, were not featured. Broadcasters subsequently proposed a revised format, under which two debates hosted by BBC and ITV would feature the leaders of the Conservatives, Labour, the Liberal Democrats, UKIP, the Greens, the SNP and Plaid Cymru. A third on Channel 4 and Sky would pit Mr Cameron against Ed Miliband in a one-on-one debate. Peter Robinson, leader of the DUP - which has eight MPs at Westminster - said last week he would write to the BBC and ITV to ask why his party had not been included. Sinn Féin, the SDLP and Alliance from Northern Ireland have all said they should be involved. Robinson: Debates - on or off? Election 2015: Will new debate offer clinch the deal?